The Lents Farmer: What to do with My Noxious Butterfly Weeds? In 2006, before my house sale closed, I began buying plants for my soon to be garden. I was living in Beaverton at the time and one of the local plant places I visited, went out of business. The nursery had a big going out of business sale and I got many great plants for almost nothing. What I ended up with included three Buddleia davidii (Butterfly Bush). I believe the varieties were 'Black Knight', "Royal Red' and 'White Profusion'. They were $2.00 each. What a bargain! 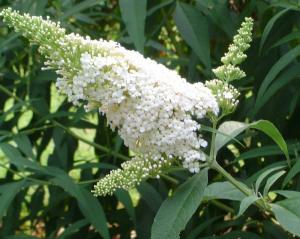 My mother had Butterfly Bush in her garden in Wisconsin and I always thought they were pretty. Since I wanted to have a garden appealing to bugs, butterflies and hummingbirds, they seemed like a good plant. I planted the the three Butterfly Bushes in the front border of the perennial bed across the front of the yard. I learned a little while later that these plants were on the State of Oregon's Noxious Weed List and they they were going to be illegal to sell at nurseries in the future. They would only be able to sell sterile varieties going forward, but it didn't mean I had to remove mine of course. But it kind of made me want to. "In Oregon, the ODA officially classified it as a class "B" noxious weed in 2004. This plant is a pioneering species that dominates open habitats. It poses an ecological threat to dry-land meadows, open slopes and dunes, dominating these sites as much as Scotch broom has historically. It also invades reforested sites, resulting in a loss of forest productivity." But they smell so pretty. Once I knew they were potentially invasive "weeds", I took care to keep them from spreading. Every year before the blooms go to seed, I hack them all off to make sure they do not seed in any part of my garden (I don't want to pull them out either!) and I compost the clippings. Every fall, I hack the entire plants down to about a foot in height. 'White Profusion' still manages to grow to 10' each growing season. Each year before they leaf out, I think about ripping them out, but they are kind of like old friends. If you were me - what would you do? We have just one of these tree/bushes (it came with the house). We also had a scotch broom which I got rid of immediately. But the butterfly bush I kept because it offered good privacy. I haven't seen any evidence of it spreading or reseeding - maybe it's a sterile version? If you like them and they aren't eating your garden alive, I say keep them. And just roll your eyes at the purists who feel the need to point out that it's considered a weed. I planted Euphorbia myrsinites and I know I'll have to hide it under a pot when the naturescaping people come by. I have a feeling many of the nursery hybrids are fairly low on the invasive scale. They don't produce much seed compared to the light purple wild-type plant, and if you pay the Oregon Dept. of Agriculture a bunch of money, they can study and certify that certain varieties are ok to propagate and sell here. I don't see your varieties on the list, but that doesn't mean they wouldn't qualify.